This was exactly as pictured. It's a little more narrow than a previous model we have so we can fit it into smaller places. We're pleased with it. I purchased this for my first baby and I'm so glad I did! This is the perfect item to have around the house so the baby has a place to lounge other than the crib. I love the portability of it and it was easy to set up and collapse when I needed to transport it. It's spacious yet compact and fits nicely in my apartment. A couple of things I think could be improved, such as the mattress. I wish it was a bit more substantial and softer, which would make it more comfortable. The mapper/changer although useful, tends to be a nuisance when you have to keep putting it on and removing it to have complete access to the entire bassinet portion. I've been using mine without the changer/napper attached and just use the changing part on its own on another surface. Overall I really like it and will soon be using it as a play yard once my baby has outgrown the bassinet. I put this on my registry when I found out I was pregnant, I loved everything about it aesthetically. I ended up not getting it at my baby shower, so I bought it on my own. smartest thing I ever did! I had no idea how easy it was to set up. The Napper was so practical and we kept the pack n play in our room as a bassinet for the first 6 months. The material is comfortable enough for our baby and yet perfect for clean up when she has those late-night accidents. When it was time to transfer my little girl to a crib, we put the pack n play in the trunk of our car and it's saved us time and time again. Whether it was hanging out with friends late at night and we needed to put our baby down or a last minute road trips. Our little one is two and we still use it when we're out of town or want to stay late at a friends house for game night. Now with baby number 2 on the way, we're looking to buy a second one great product, highly recommend, five stars, love it! I am very happy with the weight and stability of this playpen. My 4month old daughter loves it, too. This is a wonderful playpen. The only complaint is setting it up. It's a little tricky to set up, but then once it's set up, it's sturdy, it's a nice size, and I think it'll last a long time. My mother still has hers from 20+ years and 6 kids ago. The longevity is what made me want to purchase from Graco. I also have the Graco Modes stroller, which I have yet to use, and the 4ever convertible car seat. Our baby is due in January. I look forward to using all three products when she gets here. Thank you for making such quality products. Received this as a gift for our baby, the set up was a little more challenging than we expected but once it was up and put together we love it! We love the sleeper that can turn into a changing table, super helpful! I've purchased this last month & will be using for my son next month when he's here! Works out perfect for beside my bed and my other family memebers love theirs from the past! This is our second pack n play. We have a regular one but got this one with the bassinet and changer for our granddaughter. We gave the regular one used by her brother to the parents. The new one is a little easier for us because of the elevated bassinet and changer. Good basic construction makes this versatile, transportable throughout the house, that should last beyond the years of need. Definitely get the one with the bassinet early on so you won't need a separate bassinet. I don't know why I didn't buy this with my first child! We had a crib, a bassinet, and no changing station with her. This time it's all combined into one area and I love the ease of use, that it's portable, and the reversible napper/changing station is amazing and makes my life so much easier. I recommend this to all my friends now - I am in love with this product! Using at Grammie's House. Easy to set up and natural pattern for all grands. I wanted a product that I could use longer than a few months, so we got this in place of the traditional bassinet. I used the newborn napper for a month before switching to just the bassinet feature. The play yard is easy to put together and take down. In 4 months, we have used this on an everyday basis for our son to sleep in, we have used it while traveling, and we have had guests use it to play in. I can't wait to use it for my first grandchild. I love the extra features for newborns. Looks nice too! I bought this for traveling and to use downstairs at our house. Easy to set up, the baby sleeps great in the napper. I bought this a month ago for my son and his wife. Their baby boy isn't due until November 5, but I wanted them to go ahead and get used to it. They love it and my daughter in law is an expert at getting it put up and down so it should be really easy to do when the baby gets here. We all especially loved the sleeper/changer that fits right onto the top. Also loved the color. I was nervous because I read reviews that said this was hard to put together. I watched a youtube video and this was a breeze! bought this for my newborn babygirl and I love it! I live in an inlaw suite in the basement at my mom's house so this is a great addition to the family room as I can use it while I'm on the first floor cleaning and such during the day. the changing table/napper gets lots of use and we use the open part for tummy time! Great features that are helpful!! So happy I bought this !! I love the with a push of a button I can flip over the changing pad and it becomes a sleeper for my little one to nap in! And I love the grey and cream/white colors together!!! The Napper & Changer are tilted towards the middle of the bassinet. This is because the sides of the bassinet are slanted towards the middle, and Graco somehow didn't account for this change in angle. We gave this a feature a chance, but our daughter always ended up rolling to the corner of the changer. The same is true for the napper. We ended up just eliminating the changer, and we are now using this product as a secondary bassinet for downstairs, for which it's perfect. I am giving only one star though because the main feature of this model failed us. I am very satisfied with the playard, but not with the assembly of the diaper changer the instructions do not explain well and apart the pieces are very rigid to fit, the tubes that go inside to fit them was a process, when I was pregnant it was impossible and I had to tell my husband to help me, it took him two days to assemble that diaper changer, so I advise you to buy only the playard. Our baby is not here yet, but I am 38 weeks pregnant and I was able to set it up myself. The bassinet part can be a little tricky getting on all the way, but once it's all put together its very easy to disassemble and assemble. Love that is comes with a carrying case to protect it as well. Definitely satisfied with our purchase. I'm happy with this very flexible portable crib. Just what I need as a soon to be Grandmommy! I loved the bassinet and changing part. I bought it this month. My grandson loves sleeping in his bassinet, he is 7 weeks. I feel he is very comfortable. I bought this when I was pregnant with my first child. It is very easy to assemble/move from room to room. We got a lot of use out of the napper/changer. The changer is very easy to clean after each use. I liked that I could move the napper around the house. My son slept well in it. He is now a year old and we still use this inside and outdoors. Great pack n play for the price. This pack n play was a gift at our baby shower. The napper was great to lay my daughter in as a newborn. Overall it's a great pack n play with good features the only downfall is that ours didn't switch from napper to changer the easiest. Which wasn't a crisis, we got use to it the more we used it and it saved us from the extra expense of buying a changing table or potential accidents on the couch. This pack n play was a gift at our baby shower. The napper was great to lay my daughter in as a newborn. Overall it's a great pack n play with good features the only downfall is that ours didnt switch from napper to changer the easiest. Which wasn't a crisis, we got use to it the more we used it and it saved us from the extra expense of buying a changing table or potential accidents on the couch. What are the folded dimensions for this model? So frustrating that Graco, the manufacturer of these things, does not list the folded dimensions. I need to know if this will fit into my checked luggage. its a decent buy and has sturdy material. But it is too much work to assemble. moderately portable and does the job. found no use for diaper changer or napper as it leaves very less room for baby. it is a pain to remove or put up this accessory. its a decent buy and has sturdy material. But it is too much work to assemble.moderately portable and does the job.found no use for diaper changer or napper as it leaves very less room for baby. it is a pain to remove or put up this accessory. Lots of room for baby to play and so cute!! 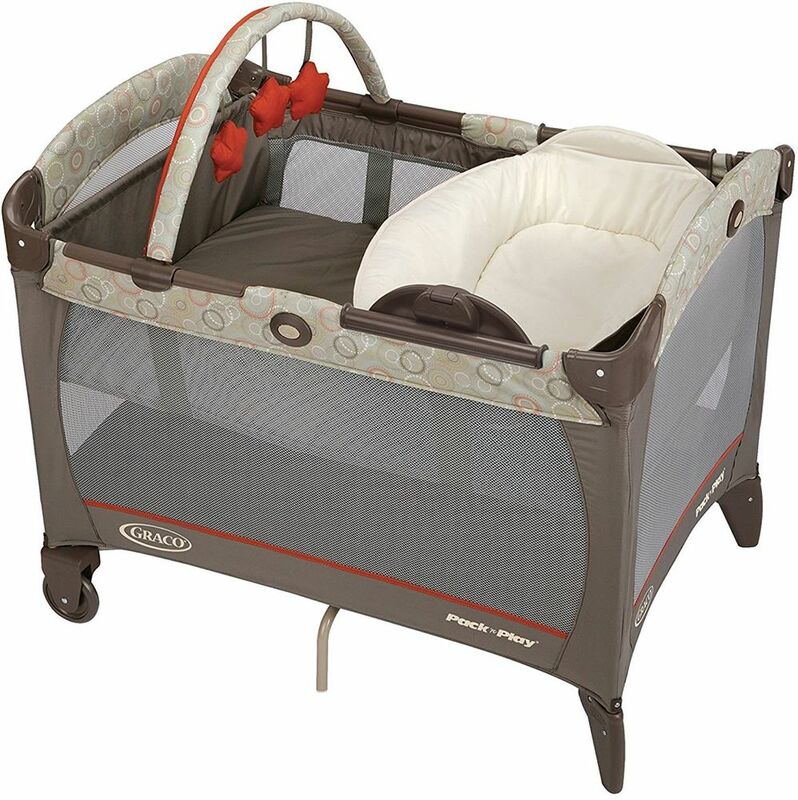 Love this playard and I highly recommend. We got this with our first baby and it came in great use. Our daughter was born the end of March and in the summer she went to her room. But in October she had to come back to our room due to our heater being old. And she slept in this till February. I recommend gravity to everyone! Our infant car seat is a grave also! The changing area/bassinet feature is awful. It is constantly tilted to one side when my baby is in it. Also, there is no way to take the fabric off to wash it! Who's idea was that?! Same with the other part-can't take the fabric off to wash it. I'm completely confused as to why this wouldn't be washable when it is a product for children. I will be purchasing a similar product but not the Graco brand. We purchased this for our first child (June 2016) and I'm so glad we did! It was really easy to set up and my favorite feature was the ability to remove the napper/changer and use it without the whole pack n' play throughout the house when I needed a safe place to put down my sleeping daughter. We kept the pack n' play in our bedroom with the reversible napper/changer insert for the first 4 months then took it out and had baby nap directly on the hanging bassinet section when she started to roll over but wasn't pulling herself up yet. Even after we stopped using the napper/changer in the pack n' play I did use the changer section through out the house and the easy to clean surface was exactly what we needed for early blowouts. The only downside I've found is storage. The hanging bassinet, the napper/changer and mobile do not fit in the storage bag so it does take up more room when storing a standard pack n' play. This is a minor setback since these features were so useful early on. We are having our second in July 2018 and intend on using it again. This was a great pack'n play. I liked the extra features like the raised platform. We didn't used the napper/changer a ton because the way it clicks on seems like it might rip the netting of the sides. Otherwise we liked it a lot. I obtained this playyard as a gift. It is currently my station away from the baby's room. It's nice and offers a nice changing area and place to put the baby down safely. I would give it more stars but the color is not my taste and the diaper caddy that comes with it is not solid enough to fit everything I'm looking to fit into it. This is my second play yard but fourth child. I don't need a lot of extras but would like a better docking system for diapers! Love Graco Pack n Plays! Not happy. Instructions are poor, for example they tell you to install mattress in bottom, then tell you to remove it for bassinet. Changer is in the wavy when installed but is very difficult to remove. We are junking our changer. If it were not so much trouble we would return unit but will keep it. Base unit and bassinet seem okay. I got this when my daughter was born. She is now 17 months. I loved the changing station/napper when she was very little. I put it next to my bed and was able to easily move her into my arms to nurse. The top pad and the bottom mat are also wonderful. She seems to be very comfortable sleeping/napping in it. My only complaint is that the pink shows every water spot. So to clean it, you have to clean the entire mat, or it will show badly. Not a huge deal, but a bit annoying if you're just wanting to clean up a bit of juice. I got this when my daughter was born. She is now 17 months. I loved the changing station/napper when she was very little. I put it next to my bed and was able to easily move her into my arms to nurse. The top pad and the bottom mat are also wonderful. She seems to be very comfortable sleeping/napping in it. My only complaint is that the pink shows every water spot. So to clean it, you have to clean the entire mat, or it will show badly. Not a huge deal, but a bit annoying if you're just wanting to clean up a bit of juice. Once it's all out together it's great, but trying to put it together isn't as easy as you'd hope. The instructions weren't specific. It says there's a diaper stacker included, & there wasn't one. Mine will not close all the way, so I can't even put it in the bag to take anywhere. I blought this pack n play for my daughter-in-law, she is very happy with being able to have the baby close to her no matter what she's doing around the house. I love that my granddaughter will have a comfortable place to nap when she comes to visit! I just received this today and I love it! it's very easy to put together, it took me less than 30mins. the mat is thick enough to where I feel confident that my baby girl will be comfortable on it. I love the napper/changer and how easy it is to flip from one side to the other. I also love how soft and plush the napper is. I got it in the Daisy fashion and I'm IN LOVE with it! the color and print is so perfect! I also like the flowers on the mobile much better than I thought I would. pictures don't do it justice, it looks much better in person. I will also be able to use this into toddlerhood. this was worth every penny! I am happy with the quality of the Pack n Play and the ease of use of the reversible napper and changer. However, my husband and I had a hard time assembling the legs on the napper because the directions did not indicate that the legs must be installed on a certain side, and the legs were not labeled. It was only after snapping in a leg and noticing a slight curve in the metal that we realized the legs needed to be flipped around. At that point, it was pretty difficult to remove them, but we pried them out and flipped them around. Please label the legs and clarify that part of the instruction manual. I have not used it yet, but it looks and feels very sturdy. Easy to assemble. The hardest part was putting the tubes together inside the napper/changer. The napper/changer is very easy to operate. Bought this for our grandchild. 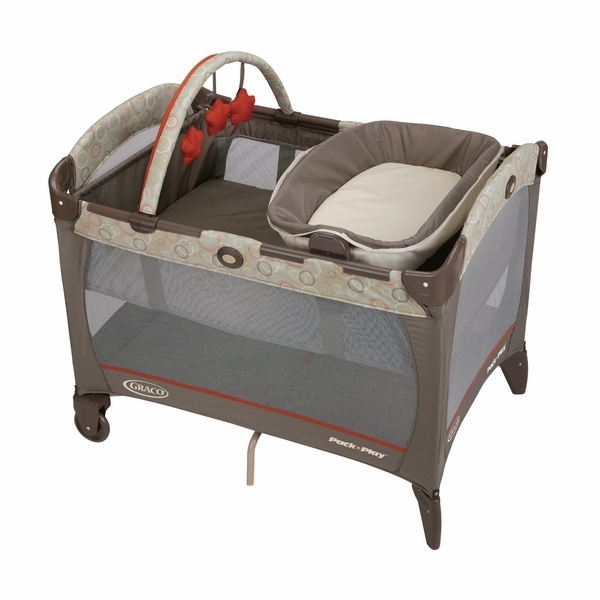 Provides a safe play yard as well as convent changing table and napper. 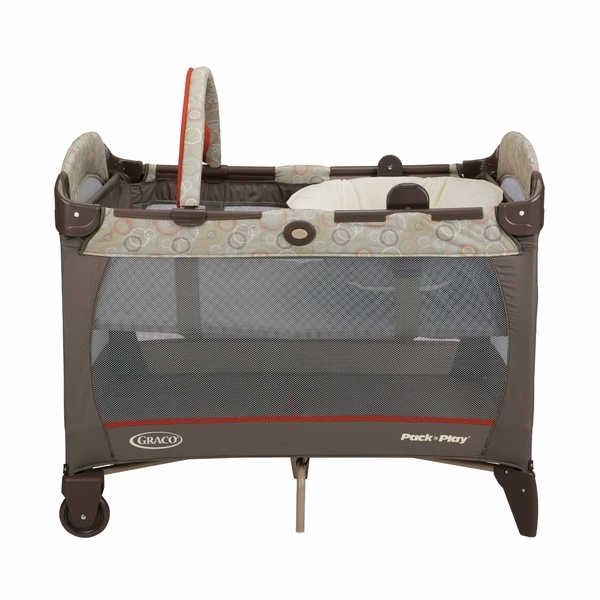 Moms have spoken and have made the Pack 'n Play® with Newborn Napper® the #1 playard in the market. Now we bring you the comfort of this napper along with the convenience of a changer all-in-one. Beautifully-styled, soft fabric cuddles baby for naps while a wipe-clean fabric resists messes for changes. This is the only playard designed to meet your child's needs as he grows from a newborn to an infant to a toddler.